Donuts – the favorite snack of law enforcers in the US is now available in a delicious looking form, but unfortunately you can’t sink your teeth into this glazed offering as it stores bits and bytes instead of calories. 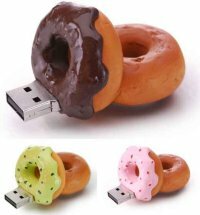 These tiny USB flash drives come in the shape of a donut and will be available in three flavors – traditional chocolate frosting, strawberry, and a weird green color. If the man in your life is a cop, this would definitely make a pleasant present.